In this radical new approach to home cooking, we use science to explain what goes on in the kitchen. Unlike other food science books, we make a direct and practical connection between the science and the cooking. We divide the book into 50 core principles, support them through detailed yet friendly explanations, bring them alive with color illustrations and inventive experiments, and reinforce them through recipes that put the principle to work. At Cook's Illustrated, we've been asking why in the kitchen for over 20 years and often find our answers in science. We believe good science makes great food and that understanding basic science will make you a great cook. 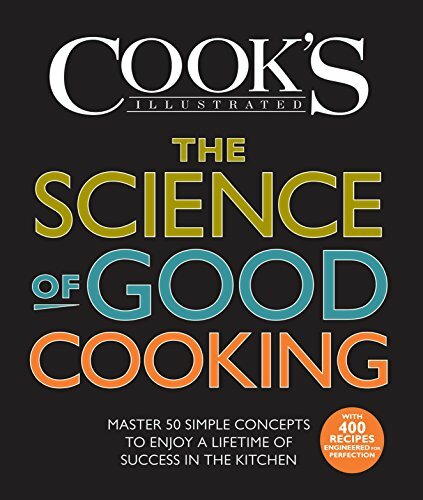 Cook's Illustrated is a widely renowned America's Test Kitchen brand that is the work of over 60 passionate chefs based in Boston, Massachusetts, who put ingredients, cookware, equipment, and recipes through objective, rigorous testing to identify the very best. America's Test Kitchen brands are well-known for top-rated television shows with more than 4 million weekly public television viewers, bestselling cookbooks, magazines, websites, and a cooking school. Discover, learn, and expand your cooking repertoire with Julia Collin Davison, Bridget Lancaster, Jack Bishop, Dan Souza, Lisa McManus, Tucker Shaw, Bryan Roof, and our fabulous team of test cooks!